Hello everyone, my name is Tayyaba and I am from Pakistan. I am currently doing a Masters in Engineering (Professional) from Deakin University, Waurn Ponds. I believe that everything that happens in your life has an amazing story behind and today, I am going to share my story of coming to Australia, stepping into Deakin University and about the wonderful opportunities I got during this journey. Two years back, I came to Australia on my husband’s visa as a dependent. His name is Saad and he was a student at Deakin University at that time. He has successfully completed his Master’s degree in Engineering Management. I did my Bachelors in Electronics Engineering from my home country Pakistan. I had made up my mind to quit my studies and I came to Australia as a housewife. Saad was really impressed by the wonderful methods of teaching at Deakin University. One day, I was getting bored at home and Saad was about to leave for his class. He offered me to visit his class. At first, I didn’t want to go but as I had nothing to do at home I made up my mind to give a visit to Deakin University. He took me to a class of Professor Arun Patil. That was the first step that I still cherish towards an unending chain of adventures, opportunities and wonders. I was astonished to see the Deakin University’s environment and its facilities. Soon after the class, my mind was totally changed in a positive way and it was motivating me to avail this opportunity to study in this wonderful university. I expressed my feeling to my parents living in Pakistan and Saad, as it was not a small decision for me. My parents and my husband were more than happy to support me in this decision. While applying for admission, I had a mixture of feeling as for me commencing a Master’s Degree was not an easy task. Finally, I received my offer letter and stepped into the Deakin University English Language Institute (DUELI). I thought it would be harder for me to adjust to this new environment but DUELI is a platform which helps students to get settled in and increase their English language skills for their academic endeavors. By participating in various DUELI social programs, I met with loads of friends and they made me feel like I am living in my home country. After finishing my course at DUELI, I applied for the DUELI Leadership and Internship Program and I was lucky to get this opportunity of doing the internship at DUELI. I got a chance to work with the wonderful DUELI Geelong Manager named “Andrea Shimmen” and DUELI Geelong Student Support Coordinator named “Jillian Chapman”. I have learned so many things by working with Andrea, Jillian and some other DUELI staff. DUELI has helped me to improve my management skills. I had the privilege of organizing different trips to Melbourne, Great Ocean Road and to various other places in Geelong. I also had the opportunity to provide several orientations to international students and campus tours to several Deakin country managers. Working at DUELI has totally transformed me into a different person. I have gained leadership skills, excellent communication, time management and confidence skills. While working at DUELI, I got a chance to meet with Minister of Trade and Investment, “Mr Philip Dalidakis” and “Mr John Molony” who is Pro Vice-Chancellor (International) at Deakin University. They asked me about my journey to Deakin and when I told them the above-mentioned story, they were extremely happy to see my enthusiasm regarding my studies. They both subsequently offered me a scholarship! (The combined funding covers 25% of my course fees). I considered myself the luckiest person on earth. It was a moment of pride for me and all the hard work that I was doing paid off. I believe that when a student avails one’s opportunity, it opens new horizons for upcoming opportunities and the same thing happened to me. While working as a DUELI Ambassador, I met with a girl named “Shu”. I was very impressed by her excellent ways of communication and high level of confidence. While working with her, I felt like she is constantly improving herself and performing better every other day. One day, I asked her how are she is continuously enhancing her skills and she told me about the Study Geelong Ambassador Program. According to her, this program was helping her a lot in gaining the necessary skills. She also mentioned to me about a lady named “Simone Budd” who was running this Study Geelong Program. I requested Shu to deliver my expression of interest to Simone. After a couple of days, Shu gave me the email address of Simone and said it would be nice if I will talked to her directly. I had a mixture of feelings at that time but I left my confusion and fear behind and sent Simone an email with my expression of interest and she invited me for a cup of coffee. I forgot to mention another thing about myself that it takes me no time to become extremely excited. This excitement always leads me towards jumping with happiness. Ha-ha! Soon after receiving the email from Simone, I literally started to jump as I was so excited to have a cup of coffee with her. We met at Deakin Kitchen and I expressed my interest to be a part of Study Geelong. Simone was very happy with my enthusiasm and told me to apply for the upcoming ambassador program for 2018. At that time, I was about to finish my first year of my Masters and the level of stress was at its peak because of continuous assignments, exams and presentation. Saad suggested me to take a short break and visit Pakistan. After consulting with Andrea, I booked my ticket to Pakistan. I was so excited and happy at that time. I took a relaxing break of almost three months and it was more than enough for me to take a fresh start. After coming back, I applied for the Study Geelong Ambassador Program 2018 and I was one of the shortlisted candidates for the interview. Excitement was at its peak and I was lucky enough to be one of the Study Geelong Student Ambassadors for 2018. Both DUELI and Study Geelong have helped me to transform myself into a totally different person and continuously take me towards professionalism which is very important to succeed. I am thankful to Andrea, Jillian and Simone for the constant support and tips they are giving me during my journey. I am very glad to be a part of DUELI and Study Geelong. As a DUELI and Study Geelong Ambassador, I got another interesting opportunity to meet with Gretchen Ho. She is a TV Host/ News anchor/ Athlete / Public speaker who came all the way from the Philippines to visit Geelong. She was keenly interested in the student perspective about living and studying in Geelong. 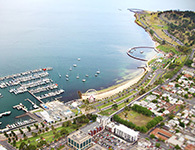 I have been living in Geelong – Australia for more than one and half years and I find it the most peaceful and calm place to live in. People living around are so friendly and kind. I have made a lot of local friends during my stay and they never made me feel like I am someone from another country. They respect your religion and you can celebrate your religious festival without any hesitation. Apart from cultural diversity, there is love and peace everywhere and this is the thing I like most about Geelong. During my journey at Deakin, there were certain times when I was about to give up because it was hard for me to manage everything but Saad is always a constant source of motivation for me and some general advice of my father always keeps me going. On the behalf of my shared experiences, I would like to say to my fellow students to never give up. Don’t be afraid to step out of your comfort zone. You will always find massive support from the people around. Keep working hard to improve your skills and become a better person than yesterday. The day will come when you will be able to get the fruit of all the hard work you have done so far. © 2017 Think Geelong. All Rights Reserved.